Note: This post is part of the Evidenced-Based Parenting Blog Carnival. This session’s host is Alice Callahan who blogs at scienceofmom.com. You can find lots of other posts here, from bloggers/parents who turn to science for help with the parenting dilemmas we all face. You can also follow the discussion on Twitter with the hashtag #parentscience. I have to admit, when considering pre-school for Mabel, I didn’t put much thought into it. I didn’t do a lot of research. I didn’t visit lots of schools. I didn’t fret about it. I pretty much went with my gut. Now, to be sure, it wasn’t an uninformed decision. I generally keep current with parenting recommendations, so I was aware of the importance of preschool. Mac and I knew Mabel was going to go to preschool, but the type of school and the timing were dictated more by circumstance than science. The reason there was no question Mabel would attend preschool (aside from the fact that it gave Mac a break to have her out of the house 3hrs/3 days a week)? The benefits are pretty firmly established. This is a great article from The Washington Times that links to a lot of primary literature and data on many of the seminal studies on preschool education- where students were tracked well into adulthood, showing lasting benefit. 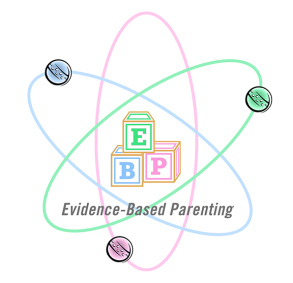 For even more in depth info and nuance of how this is studied, and we can tell if there is a benefit, see my fellow Evidence-Based Parenting Bloggers Jennifer Doverspike and Tara Haelle‘s posts. A word to the wise, know your source. Some of the data on preschool is ‘controversial’- I’m using quotes, because it’s only controversial if you look at certain, questionable, sources. Public education costs money, and is funded by tax dollars, that means it’s politicized. It’s not surprising that sources like the Wall Street Journal (which generally has a conservative slant), and places like the Cato Institute report that the benefits of preschool are short-lived, and thus should not be paid for with tax dollars. Many of those arguments revolve around how much return is to be had from investing in children’s education, in a monetary sense. Since I whole-heartedly dismiss the notion that the only value of education is to be measured monetarily, I find those arguments baseless. However, if you turn to peer reviewed scientific sources, it’s quite clear that numerous studies, dating back decades, support the long-term benefits of preschool. So, then the question turned to what kind of preschool? I should say straight out, that I don’t think where my kids go to preschool will determine whether or not they get into an Ivy League college. There may be strong data that preschool forms a good foundation for future academic achievement, but let’s be reasonable- we’re talking about a 2 year old. There are just too many variables to draw that kind of a causal relationship! I wanted Mabel to enjoy preschool, socialize, and give Mac a break from juggling two kids. We didn’t need it to offer immersion in a foreign language (although that would be awesome), we didn’t need it to be anything elite or exceptional. I wasn’t going to jump through hoops, I wasn’t going to pay an exorbitant tuition, I wasn’t going to kiss butts, fret over interviews (of Mabel or of Mac and I), I just didn’t think it was a big deal. It was only preschool- and as Melinda Wenner Moyer points out in her Evidence-Based Parenting post, the fact that I’m even wondering probably means she doesn’t really need it anyway! That said, we live in Westchester County, a suburb of Manhattan. Even our bad schools are good (or my suspicion, maybe our ‘bad schools’ are just not white)- but few provide public pre-k. Where we are, it wasn’t like I was settling for an inferior program because I wanted it to be nearby and inexpensive. One of the admin assistants at my job lives near me. Her kids are in elementary school, so just like I did when I was looking for a good bagel place, a guy to fix a flat tire, and a church, I asked her where I should look. She gave me three names of schools that her kids had attended, or that she knew of and that was the starting point of my search. The first was ruled out pretty quickly. It was through a church, and included a religious education component which Mac wasn’t crazy about. We kept an open mind and attempted to look into it. However, the fact that we couldn’t get anyone on the phone and nobody would return any of our phone messages clinched it as a no-go. The second place was a school I actually got to visit (hard to arrange visits when you are at work all day). It was Montessori style (I guess technically modified Montessori). One large room, took kids from 2.5-5yo, a lot of “play”, with a well-qualified teacher. When we visited, Mabel joined right in on circle time and had a ball. That my coworker’s son had graduated from there and both he and his fellow graduates were all kindergarten-ready was another plus. However, being one large room, we wondered if Mabel would be distracted or not get enough attention in a room where she was the youngest (for an good look at the research on pros/cons of mixed-age classrooms, check out my fellow Evidence-Based Parenting Blogger Alice Callahan’s post). The third I didn’t get to visit (work). Mac reported it was run like a typical elementary school- and seemed to be a tight ship. They say theirs is a literature-based program; however, we were both kind of taken aback that during certain times of the day, kids were allowed to watch TV! I’m not paying for Mabel to watch TV! I’m already paying through the nose for cable- if I wanted her to watch TV, I could just sit her on the couch and save the tuition money! Mac did feel that this school would make the transition to kindergarten easy- since it was basically run as such. However, he felt that Mabel was perhaps a little young for it. Given that Mabel’s January birthday means she’ll be starting kindergarten at 5y8m and not 4y8m, if we started her in September as planned, when she was 2y8m, she’d have three years to spend in preschool. How did we want her to spend that time? In an elementary school setting or a Montessori setting? Well, here is where research really pays off. I’ve written about it before, more than once- kids are little scientists. I am not alone in this (check out Fellow Evidence-Based Parenting Blogger Jeanne Garbarino’s post about her little scientists), and the data are pretty clear. Just like big scientists, little scientists, need to experiment. How do they do so? By playing. My little scientist showing off a 50ml conical tube she brought home from a visit to my lab. A 2012 review article published in Science, “Scientific Thinking in Young Children: Theoretical Advances, Empirical Research, and Policy Implications” does an awesome job of reviewing some of the seminal research in this area and distilling it. It’s not a tough read if you want to check it out, otherwise, a brief and easy summary can be found here. There will be plenty of long years (decades even) that Mabel will be in one classroom or another. Some will offer freedom of inquiry, others will require rote memorization, some will engage her, others will bore her. She doesn’t need that dichotomy as a 3 year old. Mac and I want her to use her inherent scientific abilities while she still can, I want them to be nurtured and encouraged. 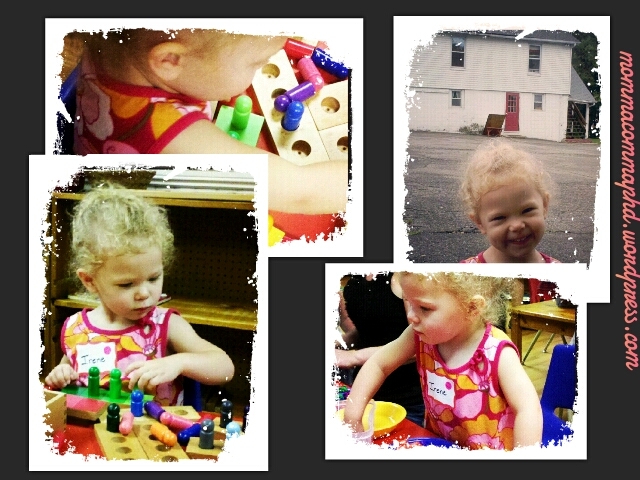 So when it came down to it, we chose the modified Montessori program and we’re really happy. Mabel’s school recently held Parent’s Day- where the parents were invited to come and spend the morning. Everything was play to Mabel. 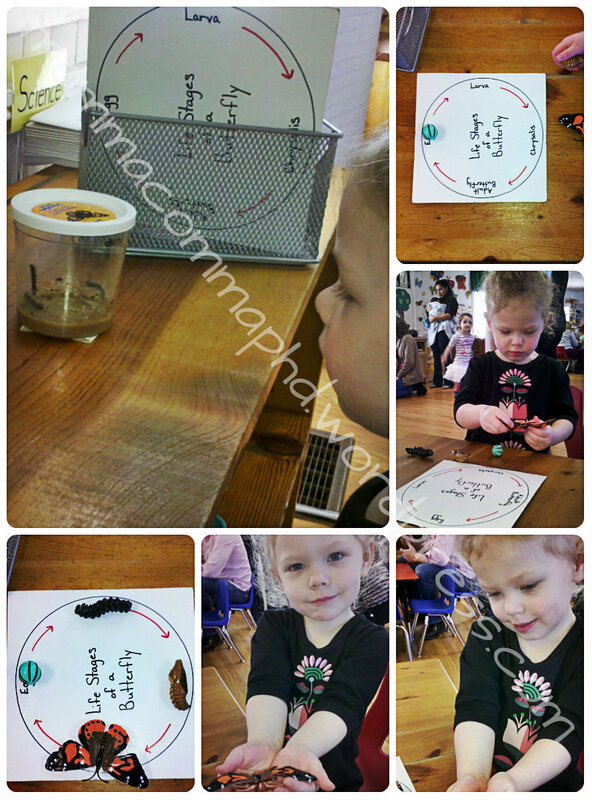 She wanted to play with the pink tower, play with the button box, play with the butterfly life cycle. Everything was play. She was learning, and she was loving it. Soon enough school will be a chore or a reason to pray for snow days, but for now it’s a lot of fun! Mabel showing me all about the life cycle of butterflies at Parents Day. [Peter Gray, Ph.D., Professor of Psychology (emeritus) at Boston College] cites a study which assessed the way 6- to 8-year-olds spent their time in 1981 and again in 1997. The researchers found that compared to 1981, children in 1997 spent less time in play and had less free time. They spent 18 percent more time at school, 145 percent more time doing school work, and 168 percent more time shopping with parents. The researchers found that, including computer play, children in 1997 spent only about eleven hours per week at play. Source. Thankfully Mabel thinks all her ‘work’ at school is playing. Still, I don’t want to manage or run Mabel’s life (or Nemo’s when he’s older). I want her to have time to do “nothing” and “just play”- which is important. Both Polly Polumbo’s post and Jennifer Smock’s post for the Evidence-Based Parenting Blog Carnival talk about the data that show just how important. Mabel is in an Irish Step Dancing class (30min once a week), and a ballet class (30min once a week). 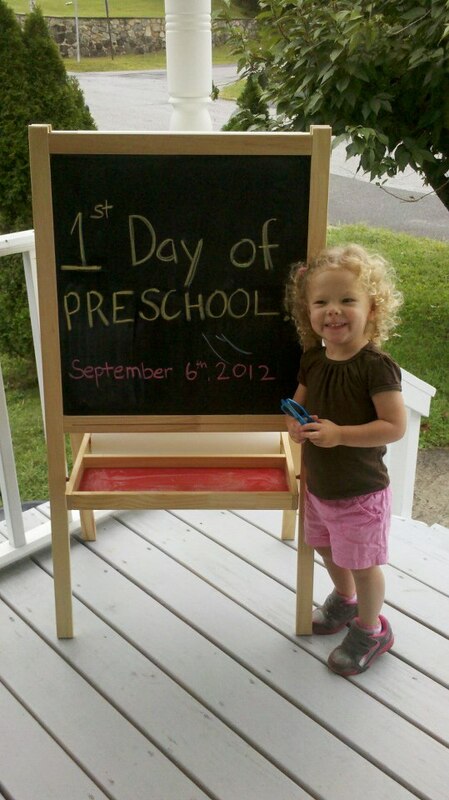 We opted for her to go to school three mornings a week (from 9am to 12pm). Next school year, we’ll up it to two full days (9am to 3pm) and one half day (9am to 12pm) a week. Other than that, she’s free to play, go to the library, do whatever she can think up. Mabel and I playing with the traditional Montessori “Pink Tower.” Step 1: Take turns moving the blocks, one by one, to the mat. Step 2: Take turns stacking the blocks in size order, one by one. Then disassemble the same way. Step 3: Take turns returning the blocks to the platform (you can see over Mabel’s shoulder in the first image), one by one. It is not surprising that Mabel mistakes her school work for play, there are many similarities (and some differences) between Montessori-style and play-based learning (source). Programs like those at her school show that students are more physically active (not confined to their seats) than kids in more traditional programs (source). Of course, there is some data to support better outcomes (ie abilities and academic achievement) with Montessori programs (here); however, Mabel is in a modified Montessori program (which some studies indicate limits the benefits). That said, I am happy to have her in a modified-Montessori, and not a strict Montessori for a reason that relates back to that inherent scientific nature. 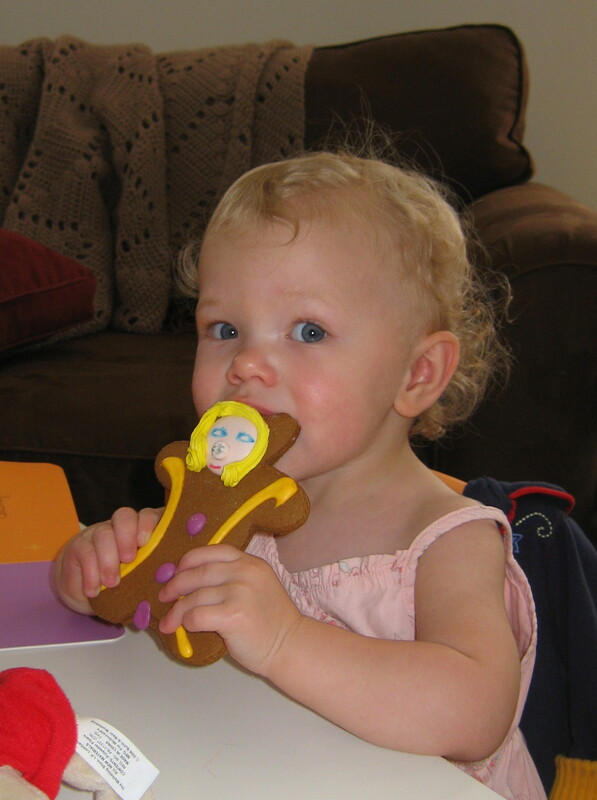 Studies have shown that children left to explore an object on their own learn more about it than a child who is shown how to use the object and doesn’t further question its features (see here). In traditional Montessori, students can’t play with items the teacher hasn’t taught them to use yet, and once they are shown the use, they should not use it in other ways (source). This irks me- certainly kids should be capable of using the items in the way they are intended (stacking blocks in size order for instance- lets them understand the spacial relationship, sizes, motor skills required to stack them, etc. ); however, I think limiting students exploration or imagination with a toy can have draw backs. Mabel’s classroom is modified-Montessori and I hope the modifications alleviate that. There is a lot of data on the benefits of different styles of learning. I have to confess, I did a lot more research to write this post than I did when picking a program for Mabel. While I knew much of the info I’ve included here, tracking down sources and finding references certainly reassured me that Mac and I made a good call when putting Mabel into her preschool program- our gut feeling was spot on. Our choice hinged on (in no particular order): proximity to home, cost, teaching style, gut feeling, recommendations from other parents, and whether the program would be engaging and fun enough to instill a love of learning while being structured enough to allow Mabel to progress behaviorally and be ready for kindergarten. I’m certain that not every parent, even given the same data, would choose the same program- certainly not all the Evidence-Based Parenting Bloggers did. 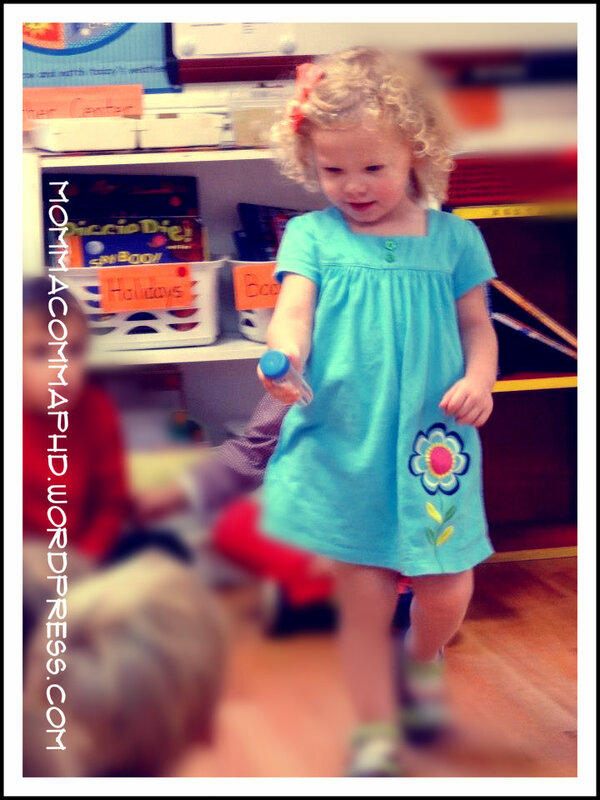 So, I’m curious, how did you choose a preschool for your little one? What did you consider? I’ve been enjoying our almost-daily sprinkling of snow. It’s enough to dust the ground and the car, but doesn’t impede travel or require clearing. I don’t remember weather like this in many years- with nearly constant snow on the ground. Mabel has been enjoying it too (see below). We were rushing to get in the car to go to school, but I really just could not help but stop and admire her making tracks in the snow. It was definitely one of those scenes in the movie of your life when you imagine the camera capturing the poignant scene. *As my Nana always said- with every talk show sob story or criminal with a troubled childhood- “It’s always the mother’s fault.” See here for my hopes and aspirations as a mom distilled into a few sentenced. Reading the other answers from other men and women was interesting- although I wonder if mine should have been more mushy? Motherhood means accepting responsibility. If you read the news or listen to the hype, you know what I mean. Every choice you make, from before a child is conceived, until long after you’re dead, there is someone out there that will tell you how it impacted your kid. As my nana always said, “It’s always the mother’s fault.” I just hope that as the time passes I get more credit than blame for how my kids turn out.- Momma, PhD.